Richard Linklater's School of Rock still remains one of Jack Black's very best performances. The director and actor work together well and manage to make a rockin' comedy that'll bring out the kid in every rock 'n' roll fan. Jack Black hasn’t had the best track record in the past decade or so, but he’s always had a few brief moments in the sunlight where his comedy works. 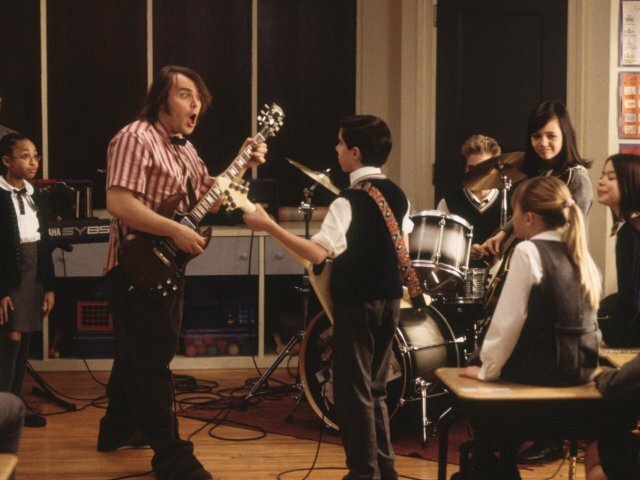 Richard Linklater‘s School of Rock is one of those rarities and I’m starting to think that Black should just stick with Linklater from now on out (especially after seeing the two work together recently in Bernie). School of Rock has your usual Linklater heart and soul, with extra emphasis on heart, because of Black’s passion for music. The two work together like salt and pepper, with Linklater providing the proper beats to get the film going and Black injecting his zany brand of humor and rock expertise around every corner. Dewey Finn (Jack Black) is a never-been rock star. His biggest moment involve jumping off a stage into an empty crowd at some smelly bar in the middle of the afternoon. His rock dreams never panned out, but that doesn’t stop him from jamming every single day to his favorite Led Zeppelin or AC/DC songs. His roommate Ned (Mike White) throws him an ultimatum and he’s forced to find a job and pay his half of the rent by the end of the week or face life out in the cold without a place to call home. At this same moment a call comes in for Ned requesting his skills as a substitute teacher at an uptight private elementary school. Dewey poses as Ned and takes the gig and eventually carves his name into fictional rock and roll history. Director Richard Linklater is most well known for his popular teenage coming-of-age film Dazed and Confused and also for his general ability at crafting human emotions without too much darkness or over-complication. His films tend to be funny and sweet without too much of that real-life pressure weighing down the characters or even the audience. School of Rock is Linklater firing on all cylinders and the result is nothing short of impressive. He managed to pull Jack Black out of a slump and in doing so he made a comedy that was funny and almost sort of inspiring because of its overall message. 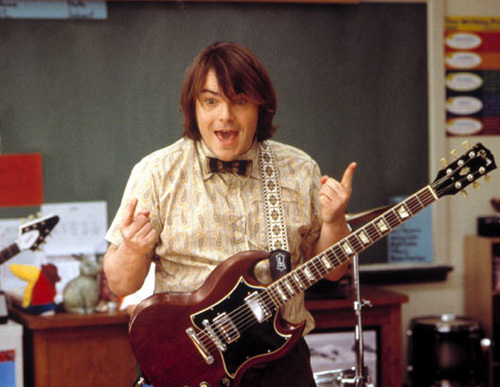 It’s mostly surface-level stuff and not nearly as memorable as some of Linklater’s other films, but School of Rock still to this day remains one of the better Jack Black efforts and a great homage to some of the greatest rock bands of all-time. Paramount brings School of Rock to Blu-Ray with a cool 1080p transfer that is steady and eye-pleasing. There’s a natural reveal of grain throughout the presentation, but that never holds complete details and textures back. It’s a hearty picture, with all of your necessary colors. Things are slightly on the dull side though and that’s due to the film’s set design and locations. The 5.1 DTS-HD Master Audio track is another rocking catalog experience from Paramount. The back channels soak up the shredding guitar solos and fun lyrics and the front channels focus more on dialogue. Well-balanced is a good way to describe this track, because almost everything shares equal importance when it comes to distributing the rock. Richard Linklater’s School of Rock remains one of the better Jack Black films in his career and one of Linklater’s more consistent efforts. Paramount’s Blu-Ray is a quality catalog title that comes with all previous bonus material, a hearty video encode and a loaded audio track. School of Rock might not be the most memorable film depicting love and appreciation for legendary rock music, but it is a film with some important messages about never giving up on your dream and never forgetting about that little kid inside of all of us. Sometimes life is just about having fun and living your dreams and I give credit to Linklater and Black for conveying that message loud and clear.